Surprise – I’ve just released a new science fiction novel called Empty Between the Stars! 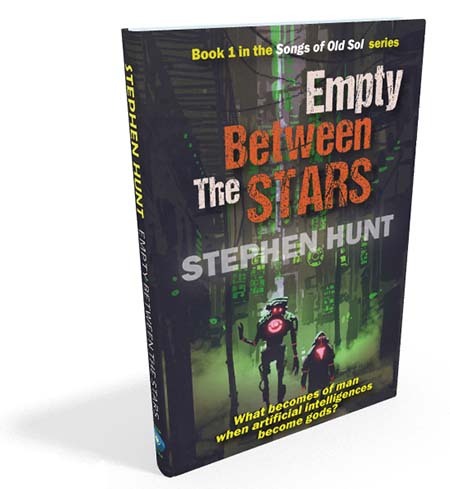 Empty Between the Stars is a science fiction adventure set in a universe where A.I.s are gods and mankind a fairly reduced force in the great scheme of things. So far, readers have told me it has put them in mind of works by everybody from Frank Herbert (Dune), Jack Vance (various), and Harry Harrison (Stainless Steel Rat). Nice company to be held in, at any rate. I’ve been getting some great reader feedback on the book which is wholly heartening – this was very much a passion project for me and I’m glad it’s hitting the right notes with you, too. It is the far future. The artificial intelligences created by humanity are now gods, and mankind mere ants who scrabble in their shadows across a million worlds. The Lords of the Great Houses on the ever-night Moon of Hexator are suspected of the murder of one of their own. And merchant William Roxley, once a magistrate-priest, is unwillingly coopted to uncover the truth behind the killings. With only the help of his naive young assistant and a brutish robot bodyguard, the man they call ‘Sweet William’ digs into the Moon’s eerie existence. A collapsing society where many strange, terrible things are happening under night’s unsettling cover. But, Hexator is a place where nothing is what it seems, perhaps not even William Roxley himself! It’s now out in both print and e-book format. I’m trying something new and have made this an Amazon Exclusive, which means the e-book is solely available on the Kindle at the moment. The print book is printed via Amazon’s own facility, and is technically available everywhere else outside the various Amazon country stores – in practice, it’s a special order item, as small bookstores and rival chains don’t like providing blood and treasure to the Jeff Bezos machine unless they have to. If you’re a member of Kindle Unlimited, this e-book is free for you to read, also. « Mission to Mightadore (Jackelian #7) hits the bookstores.